Darjeeling Pulbazar Development Block Bijanbari -Darjeeling Pulbazar Development Block, [Govt. of W.B.] Bijanbari Darjeeling has announced vacancies for Diploma holders in Civil Engineering and H.S. Passed Boys and Girls.For both vacancies Computer knowledge is preferable. 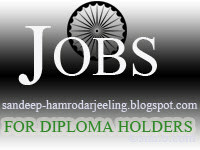 N.B: Further details and application format will be published shortly keep on visiting. thanks a lot to darjeeling, i hav subscribe this details once again thanks. How can I avail the details regarding the recruitment, i.e application forms and obtain resourceful info regarding the very details of the advertisement. Please kindly inform..